And at first it was intriguing. The novel that Edward, Susan’s ex-husband, has written is called Nocturnal Animals and it gets off to a gripping start. Tony is a mild-mannered maths lecturer and is driving overnight with his wife and teenage daughter from Ohio to their holiday house in Maine. They are ambushed by three men and Tony fails to prevent them from kidnapping his wife and daughter, with terrible consequences. These early chapters are compelling and Tony’s thought processes, the way in which he circles round and round what might be happening to his family, are brilliantly described. They find a parallel in Susan’s own thought processes as we realise through her part of the narration that she too has been defending herself from something she doesn’t want to know. On the surface all seems well: her husband is a successful heart surgeon and she is devoted to their three children. But as Susan reads the novel over three nights, she muses on her first marriage to Edward and her present one to Arnold and comes to some unsettling conclusions. The structure of the novel alternates between chapters of the novel and Susan’s reflections both on the novel and her own life, so we are constantly being brought up against the fact that Edward’s novel is just that: a novel. But of course Susan’s part is fiction too. This is a very postmodern kind of novel. I spotted a number of literary references, echoes of Robert Frost and Flannery O’Connor – even Jane Austen – and I bet there were more. 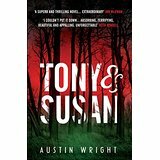 I wasn’t surprised to learn that Austin Wright taught English at the University of Cincinnati – it is an academic kind of crime novel. So was it worth reading? Yes, it was a clever idea, there were some stunning passages of writing and it gripped me at the beginning. Did I like it? Not really. I began to lose interest in the novel within the novel as it got increasingly melodramatic and skipped ahead to find out what was going to happen – and that’s never a good sign. I didn’t much like either Susan or Edward – or Tony come to that. There was a coldness at the heart of it. I’m not sorry I read it, but I won’t want to read it again. Over to you, Moira: http://clothesinbooks.blogspot.co.uk. I’m longing to know what you made of it. Later: and now I do know and it is fascinating to find that Moira and I are so similar in our reactions to this novel. Yet again we agree almost totally; we really need to be more argumentative. You put it very well – the cold heart, and that it’s a book that’s interesting, but not one for the best-loved shelf. I doubt I’ll be reading it again either. This has been a very good experience and we must do it again. Yes, not much drama or conflict between us, is there? But it’s hugely enjoyable and we do come at things from slightly different angles, so that’s interesting. I felt like you about the ending – I was disappointed but also amused. Yes, let’s do it again. Great fun. Sounds like an an interesting book, but also sounds frustrating. Since you two have read it for me, I won’t bother. I think it is worth reading, but could disappoint a person who was expecting a conventional thriller. I’m intrigued by the sound of this one, I must say. It’s worth reading. The first part of the novel within the novel is a tour-de-force of suspense and horror.